Does Islamic Finance Prevent The Future Global Financial Crisis? It is a great pleasure to share my recent publication in the Global Islamic Financial Magazine. I strongly recommend this magazine especially for bankers, business professionals, brokers, insurers, corporate, advisors, providers of financial services and any other parties interested about the recent development of Islamic finance. Full article: Does Islamic Finance Prevent The Future Global Financial Crisis? The credit crunch has witnessed the failure of conventional finance markets to prevent the economic instability and inefficiency. In this regard, Islamic finance tends to offer very promising solution as IFIs has showed very strong resilience to the current financial turmoil. As evidence, the Moody expects growth in Islamic banking assets to achieve around 10 to 15 percent this year, one of the fastest-growing segments in financial services sector despite the crisis. In addition, Islamic banking assets are expected to rise from USD750 billion at the end of 2006 to more than USD1 trillion by 2010. This raises the question of whether adherence to Islamic finance principles would have prevented the future crisis. To be clear, although Islamic finance is conceived to be inherently stable; in reality it is actually not immune from the financial crisis as it is part of the global financial system. Slowing sukuk issuance for the past two years and closure of Ihlas Finance House in Turkey in 2001 vividly demonstrate that the adherence to Islamic finance per se does not guarantee that this sector is safe from any economic crisis. In fact, Islamic finance will face significant challenges when it reaches to certain degree of complexity and sophistication of financial products and instrument such as derivatives that have been always the hallmarks of its conventional counterparts. The key role of the IFIs in this aspect is therefore to ensure that it would be able to achieve a level of resilience that would ensure its sustainability. 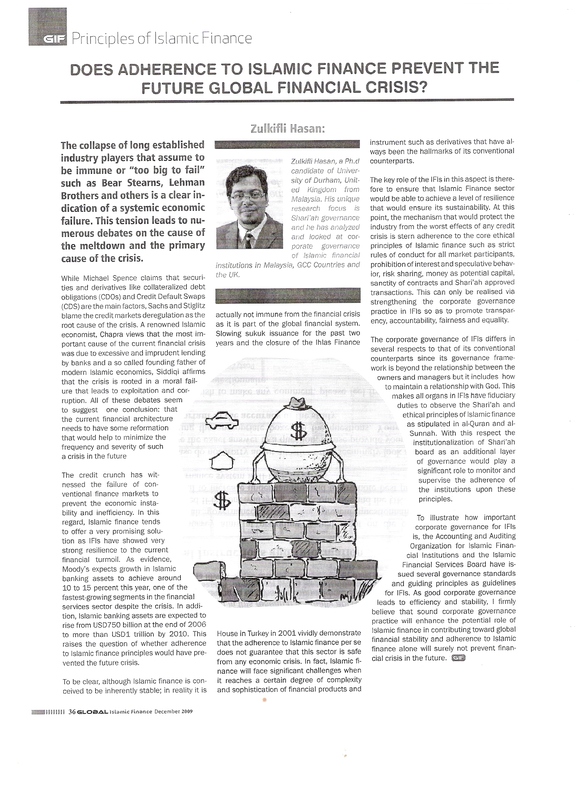 At this point, the mechanism that would protect the industry from the worst effects of any credit crisis is stern adherence to the core ethical principles of Islamic finance such as strict rules of conduct for all market participants, prohibition of interest and speculative behavior, risk sharing, money as potential capital, sanctity of contracts and Shari’ah approved transactions. This can only be materialized via strengthening the corporate governance practice in IFIs so as to promote transparency, accountability, fairness and equality. The corporate governance of IFIs differs in several respects to that of its conventional counterparts since its governance framework is beyond the relationship between the owners and managers but it includes as to how to maintain the relationship with the God. This makes all organs in IFIs have fiduciary duties to observe the Shari’ah and ethical principles of Islamic finance as stipulated in al-Quran and al-Sunnah. With this respect the institutionalization of Shari’ah board as an additional layer of governance would play significant role to monitor and supervise the adherence of the institutions upon these principles. To illustrate how important corporate governance is, the Accounting and Auditing Organization for Islamic Financial Institutions and the Islamic Financial Services Board have issued several governance standards as guidelines for IFIs. As corporate governance leads to efficiency and stability, I firmly believe that sound corporate governance practice would enhance the potential role of Islamic finance in contributing toward global financial stability and adherence to Islamic finance alone will surely not prevent financial crisis to happen in the future.